Over the many years of working in carpentry and with wood, there have been any number of weird and wonderful requests. That’s what we love about the nature of what we do. Not only can we create anything from wood. We get asked to build, tailor, bespoke design any number of amazing projects. There is always a story behind each bespoke request too. And this recent project had us litorally taking an idea by the horns. Our customer used to work at the Settle abattoir over 25 years ago. In its time it was quite a place and a busy business, but it has closed now. One of the main animals to pass through the abattoir doors was Highland cattle. Like their name suggests, these cattle came from the Highlands of Scotland and were remarked for their longevity. With their long horns and flowing coats, they are instantly recognisable across the world. During his time working there, our customer would arrive into work on a Sunday in order to have his pick of the best horns. 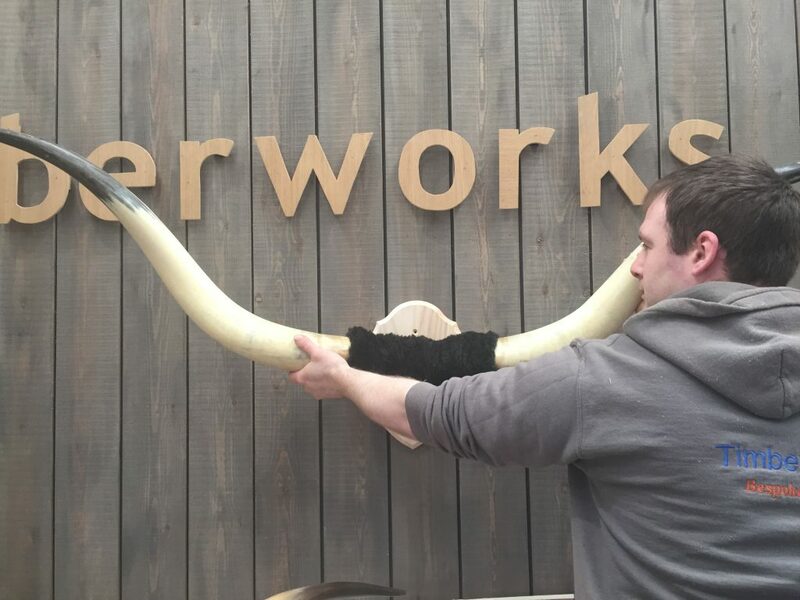 During that time, it was an honour to have trophy horns displayed and working for such a long time in that environment, our customer had been given his own set. But over time, the mount had fallen off and they were unable to be hung to the wall. The horns were large and it took the skill and creativity of joiner Robert to make a new mount for them and attach them to it. He had to be creative to insert a piece of wood into the bone part in order to it to attach to the wooden mount. The horns are a symbol of a bygone time and a lifetime of work in the abattoir, and are returned to their wall to stand proud once more.